Johnny Depp is unrecognizable as James ‘Whitey’ Bulger in Black Mass. DISCLAIMER: Okay, I know I’m late in reviewing a lot of movies, including this one. I’m hoping to do some catching up in this time. So please bear with me. James ‘Whitey’ Bulger is a man of infamy. Black Mass is a movie that attempts to reveal what type of person Bulger was and how he was able to get away with what he did all this time. It’s 1975. The streets of South Boston are ruled by James ‘Whitey’ Bulger and his Irish-American Winter Hill Gang with Stephen Flemmi as his right-hand man, Kevin Weeks as his rising rookie and Johnny Martorano as his merciless hitman. However it’s rivaled by the Angiullo brothers who have ties to the New England Mafia family. In the middle of this, former FBI Agent John Connolly returns to Boston in hopes of stopping the Angiullo brothers and does the tricky task of trying to get Whitey’s help to do so. Besides Whitey and brother Billy Bulger, who’s the president of the Massachusetts State Senate, are childhood friends. At first, Whitey is reluctant to be an informant but agrees after one of his Winter Hill Gang members is gunned down. No kidding having Whitey as an informant for an FBI agent is touchy stuff and it even causes suspicion from Connolly’s boss. However it becomes a case where Bulger is the one pulling Connolly’s strings as he uses Connolly’s ‘protection’ for covering his crimes. Whitey becomes more violent after his six year-old son dies of an allergic reaction to aspirin. He even gains more success in achieving FBI control in terms of trying to down the Angiullos. Connolly however becomes more attached to Whitey which interferes with his marriage. However the bond between Bulger and Connolly reach a turning point as Whitey orders one of his men to kill two men associated with a scheme Whitey was to profit over. One man in whitey’s ring, Brian Halloran, comes across as untrustworthy and senses him to be a possible rat. Fearing for his life, Halloran goes to the FBI for help but to no avail. Connolly informs Whitey of Halloran’s sayings and Halloran is killed. I’m sure what most people would be interested in seeing when they watch this film is yet another character played by Johnny Depp. The weird thing is about how unrecognizable he comes across with his balding hair and blue eyes. However I’m sure he was chosen because of how he could embody the character of Whitey with his criminal mentality and his personal demons both on the street and within himself. Mind you Whitey was quite the character in real life to give himself his own exile before ultimately being brought to justice only as he was in his 80’s. Some may find Johnny’s hair and make-up rather distracting but it doesn’t take away from the story. This is a story of intrigue. Those who know the story of Whitey Bulger, or even those who only know the name but not the whole story, will take an interest in why Whitey carried this all out and why an FBI agent was willing to assist. No doubt the story is mainly about Whitey. However the story is about Connolly too. It makes one wonder why a childhood friend would be so loyal to the point he’d be willing to go against his job in order to help him out despite the fact he’s carrying out such hideous crimes. No doubt the theme of loyalty is very present in the film as it is a common fact that loyalty to family and friends is something valued greatly in Boston. The theme of loyalty comes to the point where we see a scene of Bulger on the run but not before thanking Billy just before he and the other men are sentenced. The make-up of Depp as Bulger may get a lot of attention but the highlight of the film was his performance of a man who is smart but troubled and very easy to infuriate. Depp also did a good job of conveying Bulger’s growing anger and personal motives in his carrying out in the crime activities but he also did a good job in showcasing Whitey’s mind in why Bulger felt it was right in doing all these hideous crimes and why he needed his men to carry it out and an FBI to be ahead of the game. Even showing how the accidental death of his son would be the turning point in Bulger and his lust for control and vengeance adds to the story and the character. The film rested predominantly on the story of James ‘Whitey’ Bulger but it was Depp’s ability to show Whitey the person that made the story work at its best. Sure, Johnny Depp carried the film but the film did feature other good supporting performances as well like that of Joel Edgerton as Connolly whose loyalty is questioned, Benedict Cumberbatch as Billy. The performances of the wives caught in the middle–Erica McDermott as Mary Bulger and Julianne Nicholson as Marianne Connolly– added to the human element of the story and kept it from being your typical hard-story crime drama. This actually Scott Cooper’s third film as a director. The former actor’s best film making feat up to now has been Crazy Heart about a faded country star on a comeback. I don’t know if it’s as good as Crazy Heart but this is a very good film done by Cooper and is definitely his commercial breakthrough. Writers Jez Butterworth and Mark Mallouk did a good job of keeping it from being your typical mob-leader story. Black Mass isn’t simply about an infamous crime leader. It’s also about the codes of loyalty some people would do for their friends, even if it meant violating their duties as an FBI. Very insightful and full of intense moments. 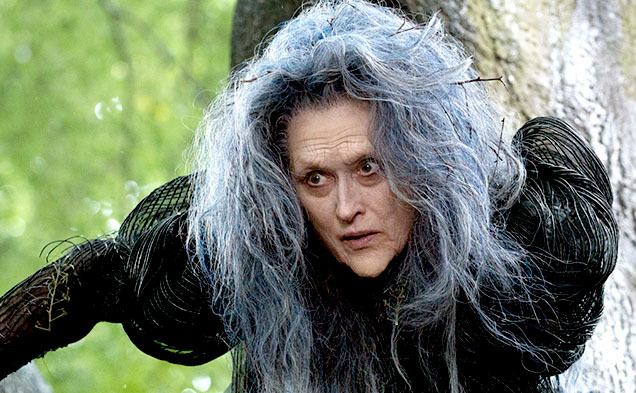 Meryl Streep plays a witch in control of the fates of fairy tales in the film adaptation of Into The Woods. Into The Woods is the latest Broadway musical to hit the big screen. The question is does it entertain and charm well enough for moviegoers? 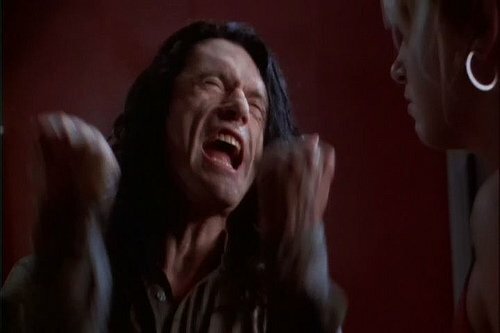 The film begins just as the fairy tales do so: Little Red Riding Hood is about to go to grandma’s with her basket, Jack has to sell the cow as she’s getting old, Cinderella is being mistreated by her stepmother and stepsisters, a lonely couple want a child, and Rapunzel is imprisoned in a castle by the Witch. The Witch puts a request on the couple. You first thing it’s just Rapunzel’s hair but she also asks for a red cape, a white cow and a golden slipper. As they search the stories proceed: Riding Hood is lured off the path by a wolf, Jack goers to market but will only accept an offer that would mean the return of his cow, Cinderella arrives at the ball. However the couple find their way into the story or pass by it: Jack receives magic beans from the husband, the wife tries to swipe Cinderella’s slipper off her feet after running from the ball, the husband passes the tower Rapunzel is kept captive in, and both notice Riding Hood’s cape. After a series of misadventures, the couple has all the items needed to produce the spell to receive their baby, all the fairy tale characters have their expected happy endings and the witch is able to regain her beauty with the potion. However the ‘Happily ever after’ endings don’t end up being so happy after all. The Baker worries he might end up being a poor father to his son just like his own father, Cinderella loses her charm for prince charming and the lavish life with it, Rapunzel is scared by the outside world, the witch loses her powers with her returned youth and Jack is pursued by the giant’s wife –ahem, widow– who came down to earth via a second beanstalk and demands Jack or she will destroy the village and its inhabitants. Soon everything goes opposite to what’s planned. Casualties include the Baker’s wife who fell for Prince Charming before her accidental death, Rapunzel as she ran off forever with her prince, Riding Hood’s mother and grandmother, and Jack’s mother. The latter three killed in the Giant’s Wife’s rampage. On top of it, Cinderella and Prince Charming part ways. At first those still standing–the Baker, Cinderella, Jack and Red Riding Hood– think that Jack should be offered back only for them to blame each other. Nevertheless they do work things out, defend against the Giant and there’s the genesis of a new fairy tale the Baker reads to his son. I have to say as a musical, Into The Woods was probably not the first time fairy tales have been mixed together to surround a main plot. It’s not even the first in motion pictures. Remember Shrek? What it needed to do was stay true to the fables while mixing the story of the baker and his wife as well as the haunting of the Witch during the first half and then allow for a believable twist to the fables we all know to occur in the second half. Even though the twist occurred starting with the giant’s wife appearing, all the twists of the stories had to appear sensible and pertinent to the original story. Some of the twists were very surprising and even tragic but it did come together in the end. That’s how the stage musical of Into The Woods worked. The next trick was to bring Sondheim’s musical to the screen. Putting a stage musical to screen is a very difficult thing. There’s a lot of decision-making on what from the stage play to leave in and what to leave out. That would fall into the hands of director Rob Marshall and scriptwriter James Lapine who wrote the original Broadway version. However when it’s Disney that buys the rights, you think it would be a big break but there was an added challenge. Naturally with this being a musical about a mish mash of fairy tales, Disney would want to make this a family film and that could be intrusive to the control Sondheim and Lapine have over the play. This was not the case as both Sondheim and Lapine insisted to Disney that any changes would have to be approved by them. Even then, they would have to work within time constraints and keep it to a respectable running length. In the end, Sondheim, Marshall, Lapine and the production company were able to create a finished adaptation 125 minutes in length that brings the musical to a big screen audience with big-name stars and additional musical talents. I myself cannot compare the film to the stage version since I’ve never seen the stage version. I will start by saying it doesn’t surprise me that Disney acquired the rights to adapting the musical to film as Disney is world famous for bringing fairy tales to life. I will say that one can do a good job differentiating the actors who know how to do musical acting and those who don’t. You just know it. There were some like Chris Pine and Mackenzie Mauzy who struggled, there were some like Billy Magnussen and James Corden who could have done a better job, there are some like Daniel Huttlestone, Lilla Crawford and Tracey Ullman who know how to deliver both singing and acting and then there are actors like Emily Blunt and Meryl Streep who are able to deliver a performance in a musical. Meryl was especially excellent as she had the role that would hold the film all together. Musical film is another genre she can add to her list of accomplishments. I will say that the film adaptation did very well in terms of special effects and set design to give the fell like there really was one terrain in the world where all the original stories happen at once. Colleen Atwood once again knows how to create the right costumes for the movie. The music was not a problem at all as the songs were well-sung and fit the scenes well. The film also did a good job of handling the story where all the fables get their twist in the end. However the film does leave some noticeable things out. There are some times where it felt the story had key scenes left out like the big bad wolf living in the tree about to eat Red or Jack in the giant’s house or Cinderella’s fairy godmother creating her clothes for the ball. There were even some times when one could easily forget that this is a musical and it would take a song some time later to remind you. There were even a couple of scenes that made you wonder if it should have been kept in. I can’t think of a better way to do it but I’m sure there are areas that could have been done better. Rob Marshall did a very good job of directing. It’s fair to say this is his best work since Chicago but there are some areas I feel he could have been better, like not having us forget this is a musical in some areas. It may not completely be his fault as the script was written by James Lepine. Lepine may be an accomplished scriptwriter and director in musical theatre and this may be Lepine’s best musical ever but somehow he could have done a better job at a stage-to-screen adaptation. The film adaptation of Into The Woods has been long awaited. Now that it’s here, it’s imperfect but very enjoyable and entertaining. DISCLAIMER: Hi. This is my second-last summer movie review where I’m playing catch-up on my reviews. When I give my review of Harry Potter, I will finally be all caught up. In the meantime enjoy yet another late summer movie review. There should be a “Captain” in there somewhere. As I said before, the summer movie season is usually about the tried-and-true making big box office results. It’s at the box office where we learn if it’s tried-and-true or tried-and-tired. Up for this summer is the fourth installment of the Pirates of The Caribbean series: On Stranger Tides. Returning is Johnny Depp as Jack Sparrow, his most popular role of all-time. The big questions are does Jack still have the winning charm at the box office? Also does the latest Pirates adventure still have what it takes to thrill and charm and keep the Pirates phenomenon active? This time Jack’s quest is the Fountain Of Youth. King George wants Jack to guide it to beat the Spanish. The one surprise is that his nemesis from the first movie, Hector Barbossa, is now a privateer in the British navy and now heading it. Already the intrigue would start for the die-hard POTC fans. Another interesting thing that he would be foiled by an imposter of himself: former lover Angelica who is Blackbeard’s daughter. The part of the mission involving capturing a mermaid’s tear and a captive falling in love with a mermaid is probably the only thing in the movie that’s even close to fresh. The tear being collected by Blackbeard starts the rivalry scenario all over again. The main rivalry in the movie is different, if not unique. This time Jack Sparrow and Barbossa join forces to defeat Blackbeard. Barbossa has a grudge match of his own against Blackbeard for his amputated leg. Meanwhile the Spanish battle the Pirates for the sake of killing the fountain because they believe it’s cursed. Often rivalry upon rivalry upon rivalry gets too confusing unless it makes sense. Not here..
One glimpse at the storyline is that you could easily see it was hatched together in an instant. We see the typical formulas of the Pirates movies: Jack being his flamboyant cocky self, rival pirates, lands to conquer, new nemeses and new loves. This has been common ever since the first Pirates movie burst on. Its winning formula is now starting to become stale and predictable. Even the character of Jack Sparrow has lost his charm over the years. When he first arrived, he was arrogant, eccentric but charismatic and was able to charm the audience. If it weren’t for Jack’s personality, the first Pirates of The Caribbean movie could have been seen as a joke. Now Jack looks like a rehash that’s getting tired out and only tries to be entertaining. Penelope Cruz plays the typical lover of Jack. Villains are practically predictable. Often when an action scene or a battle comes on, I often question “Who didn’t expect that?” The only things close to being fresh was the mermaids and the surprise of Barbossa being an ally of Jack instead of a rival. Outside of that, it remains formulaic. As for the business, it’s already showing signs of waning. 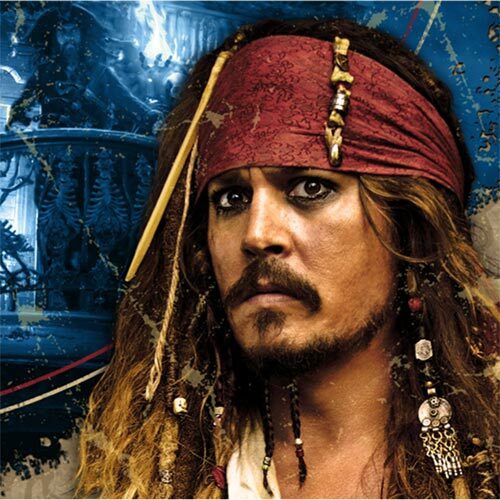 The first movie, Dead Man’s Chest is the biggest grosser with almost $425 million. The follow-up, The Curse Of The Black Pearl had a record-setting opening weekend but its overall gross failed to top Chest. On Stranger Tides is the lowest-grossing of the Pirates movies with only $240 million. The future of the Pirates franchise should make a lot of Disney execs think whether the fifth movie is worth it or not. Pirates Of The Caribbean: On Stranger Tides is a movie that will only excite Pirates fans at the most. It offers little freshness or anything unpredictable. So unless you’re a fan of Jack Sparrow, I believe it’s not worth it. Oh yeah, just to let you know you’ll only have one more summer movie review after this. Then I’m finally caught up.